Annual cost comparison for DUIs based on ages – A driver who is convicted of a DUI charge should be aware that there will be significant direct and indirect costs applied. The obvious direct cost is the cost of the fine. The fines vary from state to state. Some states are relatively lenient, with a fine of $300 and no minimum jail time. Others have fines ranging up to $5,000, and jail time of up to a year. A bond, or bail is likely to be required to be released after arrest. A bail bond can range from $500 to $2,000, and the defendant will need to pay at least 10%. Legal Fees to ensure the driver is effectively defended. Legal fees will vary based on the lawyer and the state. A basic defense is likely to start at $1,000. Cases that go to trial will cost substantially more, with fees in the range of $7,500 to $10,000. Court Fees are in charged addition to the fine and the attorney’s fees. These will also vary based on the jurisdiction, ranging from $200 to $2,000. Increased insurance costs from the auto insurer. Some insurers will decline to renew insurance following a DUI conviction. Others will substantially increase the insurance rates, and a financial responsibility certificate (an SR22) will be required. The cost of insurance can almost triple. In addition to the cost of the SR22 for three years, insurers may remove ‘good driver’ discounts for up to ten years. Select Insurance Group is a provider of Cheap SR22 Insurance to high-risk drivers. Drivers who move their policies to Select Insurance Group will minimize this additional cost, and reduce the indirect influence of the incident by hundreds of dollars over the three years following conviction. Diversion Programs are available to drivers convicted of a DUI offence, and may reduce other indirect costs. Drivers will need to pay for the cost of the diversion program, which may be up to $300. Each state DMV will charge a license re-instatement fee. The cost of this can be over $600, depending on the state. Other costs include the cost of public transport during the period of license suspension, and the risk of lost wages. Even drivers who avoid jail time will have time away from their work place as they have to be available to appear in court. The ongoing cost of car insurance that will be increased due to your driving history. Plus you will need to carry proof of insurance for three years. Actual costs will vary based on a broad range of factors that insurance companies considers when providing quotes. The important factor to note is that a driver with a DUI conviction has the risk of paying up to $2,400 a year more than they did before the conviction. 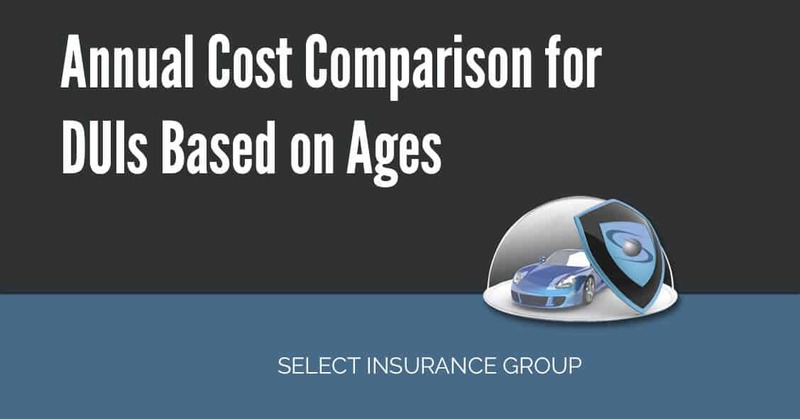 By taking out insurance with Select Insurance Group, these costs can be minimized. Newer Filing car insurance claim – 2016 guide, how to? Older What If You Can’t Afford an SR22?